Guest Editorial by Joe Scott, first published in the Seattle Times on April 24th, 2018 reprinted with his permission. Joe Scott has worked on grizzly-bear conservation in Washington and southern British Columbia for more than two decades. He is the International Programs director for Conservation Northwest. Many were stunned when Interior Secretary Ryan Zinke recently endorsed grizzly-bear restoration during his visit to North Cascades National Park headquarters. For once, Theodore Roosevelt would have approved. To Zinke’s credit, his statements provide the most succinct answer to those who question the need for grizzly recovery in the Cascades. Zinke also praised the grizzly recovery Environmental Impact Statement planning process that was cut short late last year. Federal agencies were in the midst of reviewing more than 126,000 public comments submitted during the process. Indications are that the vast majority of comments support grizzly restoration — consistent with past public input and polling. Restoring grizzly bears to the North Cascades is part of a national strategy to recover this threatened species as required by the Endangered Species Act. The recovery strategies that are chosen in the Final Environmental Impact Statement will take several more years to implement. There’s little time or need for further delay. 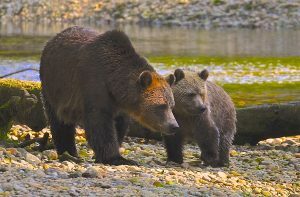 Added in 1997, the North Cascades is one of only five grizzly bear recovery zones. That means the trails, forest roads, campgrounds and backcountry uses are already managed to support coexistence between bears and people — a reflection of decades of work on grizzly-bear recovery. It’s apparent that our region’s grizzly bears will not self-recover. Their extremely low numbers and geographic isolation from stronger populations far to the north and east conspire with grizzly bears’ very slow reproductive rates and female bears’ tendency to adopt home ranges largely within those of their mothers’. All of which means that wildlife managers must move a handful of bears from healthier populations to restore grizzly-bear reproduction in the North Cascades — essentially jump-starting recovery with animals from similar ecosystems that have not previously run afoul of people. Conservation Northwest and our colleagues support moving approximately 25 bears over 10 years into the North Cascades ecosystem as a measured approach to reestablish grizzly reproduction — with additional animals added over time to replace those that die prematurely or don’t have cubs. It’s a scientifically-sound restoration strategy. This is the point where the hair of grizzly-bear naysayers catches fire. A familiar objection focuses on animal transplants as particularly frightening. Some offer that they “support natural recovery but not bear transplants.” But the science is clear that transplanting bears is the only way to recover them in the North Cascades. Opposition to bear transplants equates to opposition to grizzly recovery in this case.